ORIGINAL TRADE PAPERBACK. Sequel to tough and gritty time travel thriller Blood of Heroes. 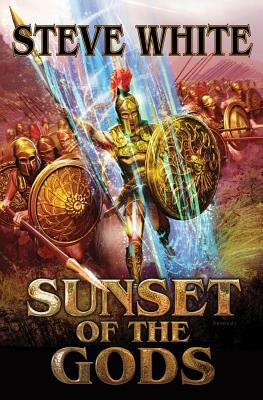 A team of time travelers goes back to the Battle of Marathon in ancient Greece to foil a plot by alien masquerading as gods and by evildoers from the future. A compelling, well-researched battle scene caps it all off. Sequel to tough and gritty time travel thriller Blood of Heroes. Jason Thanou: a time traveler with a past and a burning mission. When the gods of ancient Greece proved to be not only monstrously real, but totally alien--and poised to dominate humanity forever--Jason took care of the situation, at least in Minoan Crete. Now he's got what looks like a normal assignment: to lead a time traveling expedition of scholars to the battle of Marathon and record for the benefit of future historians the magnificent stand of Greece's hoplite warriors against Persian invaders. Steve White completed a tour of duty in Vietnam as a naval officer. With David Weber, he has collaborated on Insurrection, Crusade, In Death Ground, and the New York Times best seller The Shiva Option. His most recent books for Baen were the epic fantasy Demon's Gate, science fiction novel Eagle Against the Stars and the science fiction time travel series that includes Blood of Heroes, Sunset of the Gods, and Pirates of the Timestream.